Association: Storytelling, case studies, fables or parables, essentially linking ideas together. Elaboration: Repetition or rehearsal both rote and elaborate. My wife and I use these techniques to help our kids study and I am now beginning to apply them to teaching scouting skills, however, thinking through how you would apply these processes during a university course has been an interesting experience. A common understanding of the learning process bridges the gap between teacher and student. Nobody taught me how to learn, did they teach you? Why not? Why don’t we take time to teach people how to encode and apply information? When I work with presenters, I naturally practice the techniques I am teaching. Now that I am spending more time teaching in the non-commercial world of scouts, I’m finding the need to teach learning skills simply as a way of explaining my actions. Attention – kind of obvious, you can’t learn something you didn’t pay attention to, so we create intentional gaps in information (visual cognitive dissonance) to keep the audience engaged. I encourage students to not only question what they are being taught, but also why they are being taught it – an essential step in the learning process. Synthesis – is the process of moving the information you are paying attention to into your long term memory. It’s not a linear process. You must break down the whole subject into chunks and associate the pieces to existing, relevant information already stored in your long term memory. Processing the information on more than one cognitive level – visualization – and finally the echo – repeating these activities to firm up the new information’s place in our LTM. Retrieval – the final stage of learning is creating the capacity to share and use information. The ability to recite facts doesn’t really demonstrate learning – you must be able to use or those facts to truly benefit from the learning. Retrieval also prevents memory loss! Clearly, the more you use information the less you forget it. 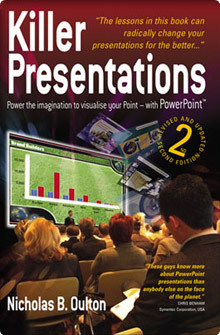 Understanding the learning process is an essential part of designing effective presentations. As I work more with the scouts, and now with university students – tough audiences both – I realize how just how much this holds true. Please give me your thoughts on the matter – and your suggestions for making sure people remember the message you are trying to deliver. A very convincing case for making an effort during the semester as opposed to only at the end (and very well presented too). Students around the world, take note! - but was a bit confused when you were talking about Relevance when the word REPETITION was on the presentation about CRAVE …. corrected in later slide. Perhaps a reminder that all slides need to be proof read before presenting? Maggie, thanks for catching this and your right slides should be proof read. Here’s what happened.. The video is shot in front of a green screen and the slides added afterwards. We picked up the error on the day of the recording but then the post production team have used an old version of the slides.. I guess the lesson is check, check and check again. If such techniques like that of those mentioned in your video were introduced to the younger generations I am sure I, a more pleasant schooling experience with greater knowledge and success would follow. However, we often don’t think like that when we are very young. That said, since reviewing this video I have begun to draft a 10 – 15 minute session that mentions such methods of learning along with other techniques and hints ahead of training sessions. It is my intention and belief that by making the people with whom I work more aware of these techniques and others like that mentioned in Tony Buzan’s (The Memory Book); that personnel in the office will be able to retain more information in shorter spaces of time, and thus become more effective within the business. Thanks again for creating this video, I found it most informative. I would love to embed this video into a jive community site so that my peers have easy access. Is there an embed video link to the Crave Learning Video? It is an excellent presentation! Is it possible to use the video for my undergraduate students? Is it possible to download it ?